Return Shipping Label If you would like to buy two pair of boots so that you can compare size and/or type, then a return shipping label will let you return the single pair that you do not wish to keep. When ordering 2 pairs of the same boot in different sizes make sure not to order a whole size and half size. For example, an 8/26 and an 8.5/26.5 are now the same size boot with no changes. Boot Bag Options If you would like to buy a boot bag at a discount please choose from one of the bags below. The 2012 Alpina X5 Ski Boots are designed for beginner to intermediate level skiers looking for a boot that is comfortable and not expensive. 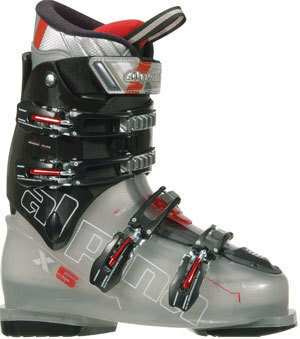 If you are a lighter weight skier or a skier that is not aggressive the Alpina X5 ski boots are a great option for you. Why rent when you can get a good pair of ski boots for so little money. Alpina does not spend advertising dollars and that helps keep their product costs so low. Check out the great features this boot has for the money. View other products made by Alpina.